I swear my Jennifer Love Hewitt Fancy Box isn’t super late—it always arrives at the very end of June/beginning of July so I’m still on track for this one. I had received an email from Fancy, confirming my tshirt size for this box and I was concerned since the last time I received that kind of email I ended up with a hideous “Fancy” Shirt. (You can check out that disaster here). Well, I guess it’s not a Fancy sub if there’s not some strange mystery involved, because I didn’t get a t-shirt in my box after all. What did I get? Let’s see. 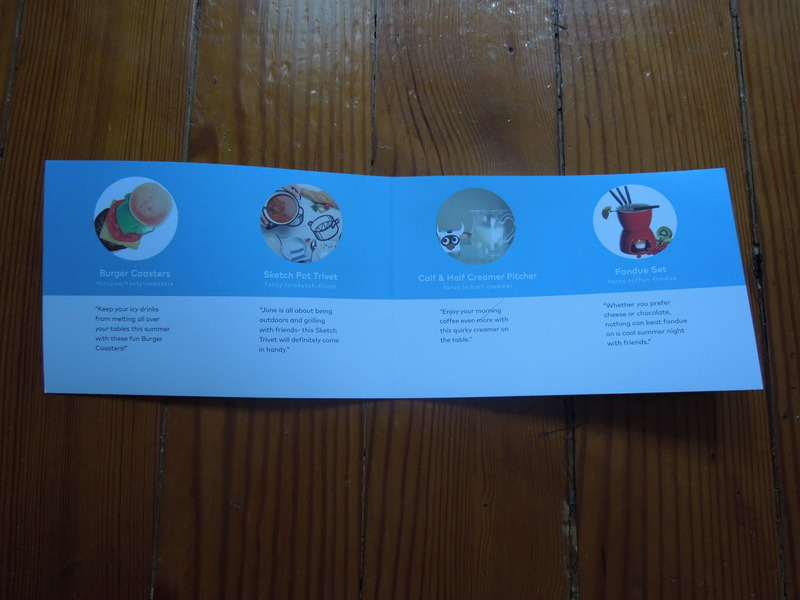 And our new and improved item brochure (in lieu of our usual cards). 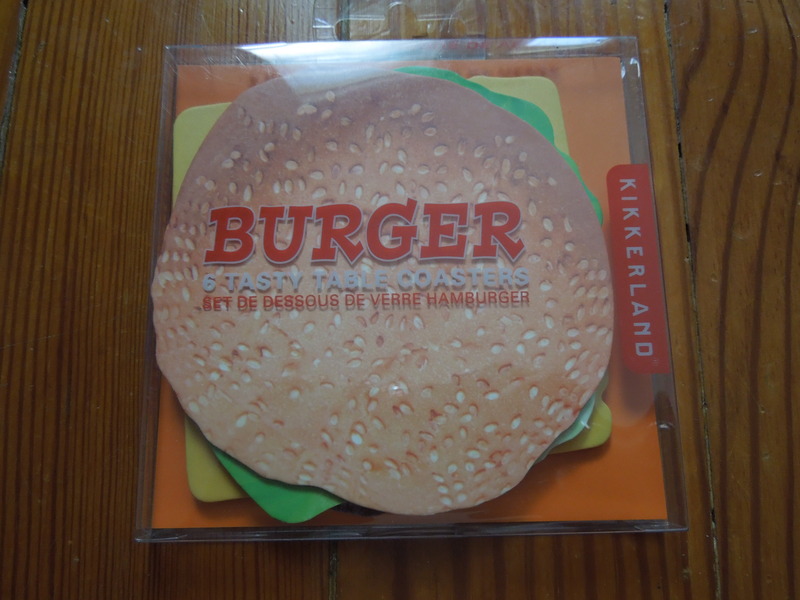 I have plenty of coasters and these aren’t quite my taste, but they are fun and I think that I can add them to some other cooking/food/hostess type gifts. 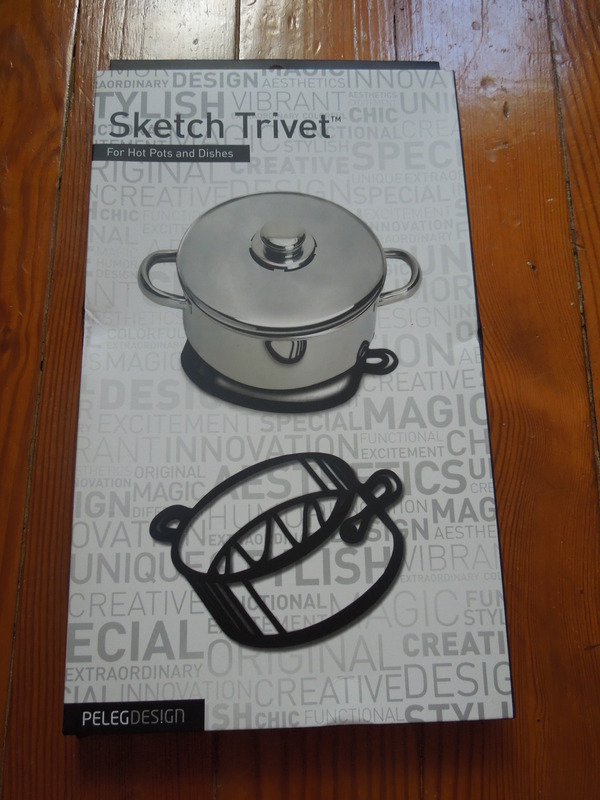 It’s looking like our theme is hosting and just like the coasters, I have a trivet already. This is cute though and just like the coasters I can use it for a gift. 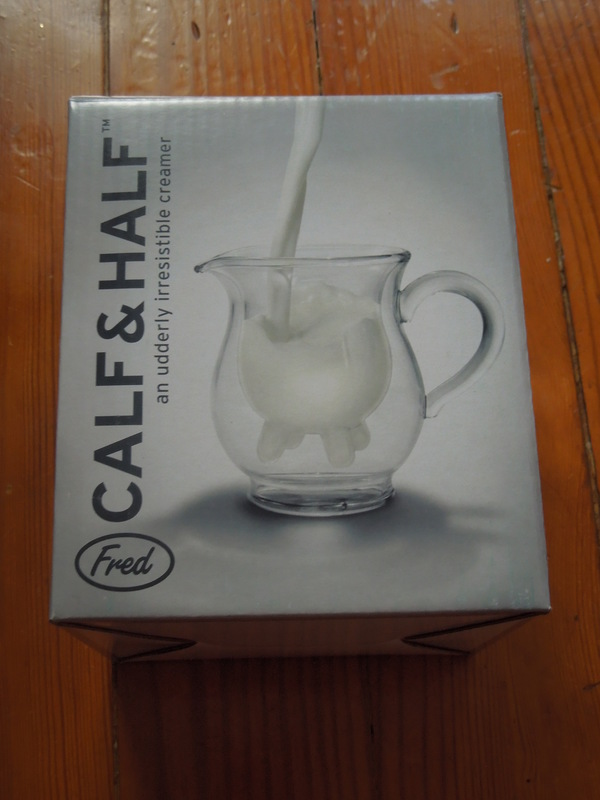 Description: “Enjoy your morning coffee even more with this quirky creamer on the table”. Do I have a little creamer pitcher? Yes. Do I have one this whimsical? No. I think this pitcher is so adorable and it’s quite a cute gift. I’m not sure if I’ll end up keeping it (since I do have something for this purpose) or give it as a gift. This is my favorite item in the box since it’s the one thing I don’t already own. 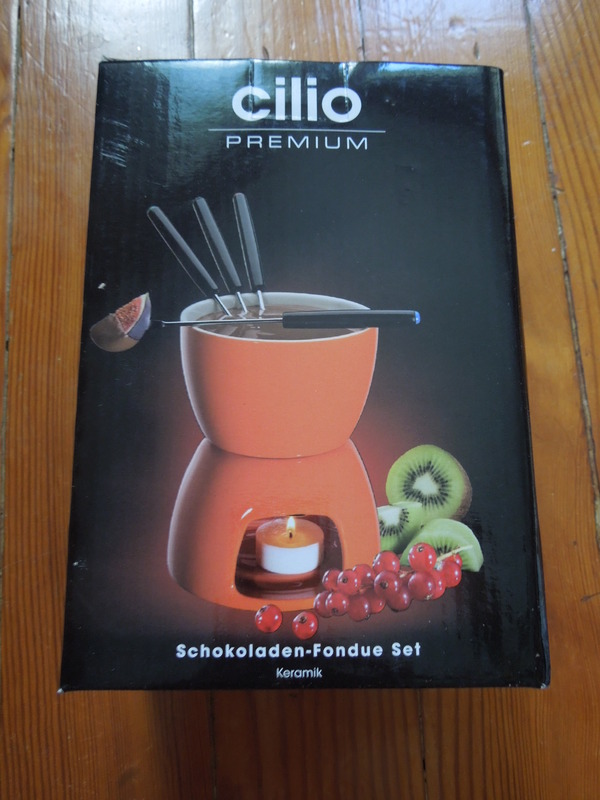 I don’t have a fondue set and I’ve recently started a low carb diet, so I can use this to try out some cheese fondue recipes. The bright orange color on this is fun (although I wish it had been red). Let’s start with the positives. 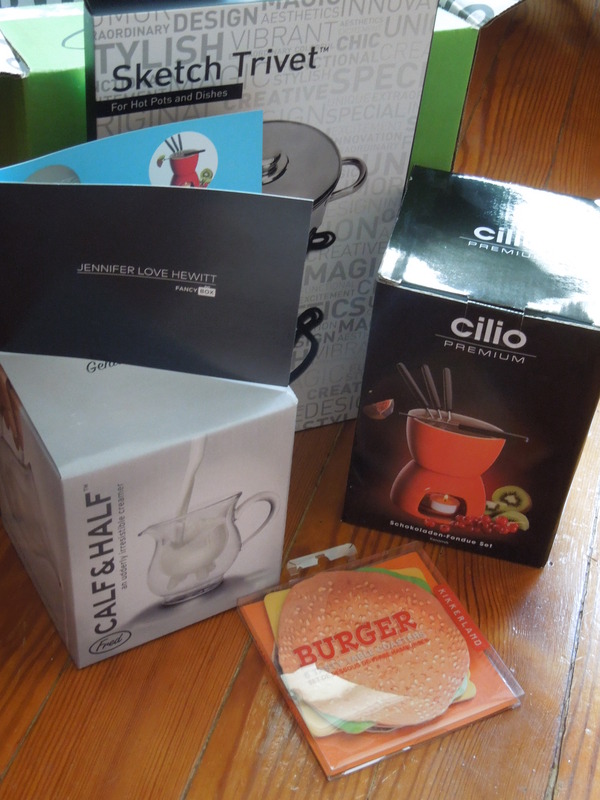 I like that this box had a cohesive theme (Outdoor/BBQ entertaining) and all the items coordinated together. The downside is that when I did the math, the value of this box was only $78.00 (and we are promised $80+ per box). I ended up paying only $25.95 because I returned a duplicate item from my April original Fancy box and got $20.00 in credit. At the reduced price I’m fine with this box, but I would have been upset if I’d paid full price. (Although technically I did since the $20 was a refund). I think the items in here were fun, but the box probably should have included at least one more product to bring the value up. I think the fun, whimsical aspect of the contents ties into the type of aesthetic I expect in a JLove Fancy box, so that’s also a point in the plus column. What did you think of this box? Would you have enjoyed these items, or is it all stuff you already own? 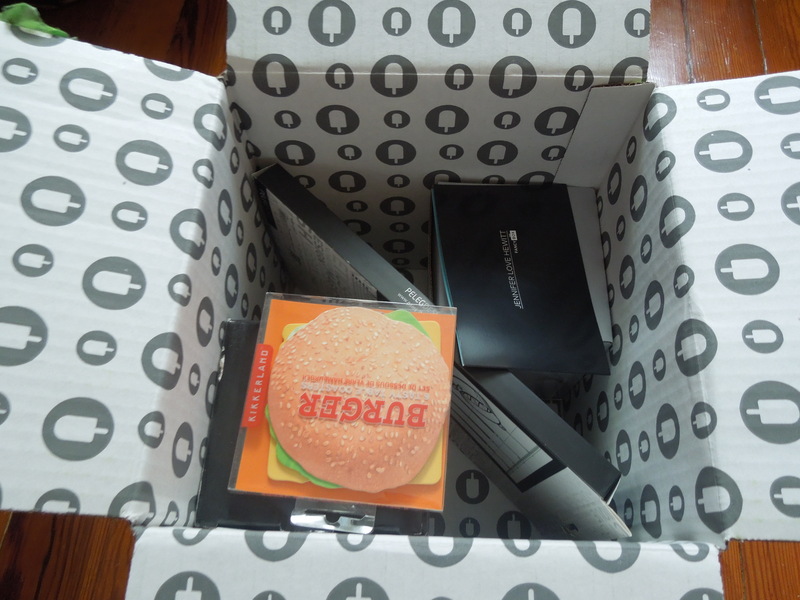 Fancy Box is a monthly subscription service that curates items that are popular on the Fancy website. There are a few different subscription options. They all cost $39 (unless otherwise noted) plus shipping (an additional $7.95). Each box includes $80.00+ of products. Most boxes are geared toward men or women though they do include unisex items. Isaac Mizrahi Box#4 New Mystery Boxes! 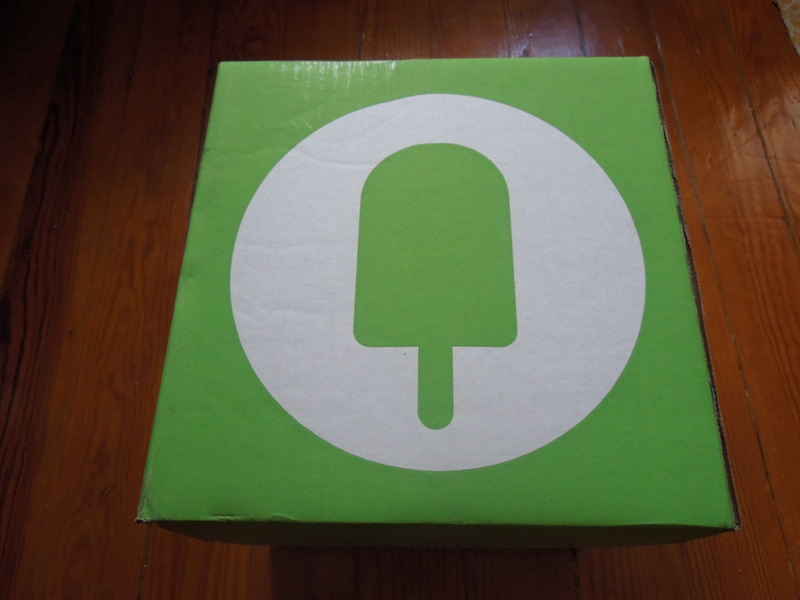 You’ll receive $30+ retail value worth of goods. Just pick an option, Men’s or Women’s, and they’ll pick out some items that tickle your Fancy. Cost is $10 plus shipping (estimated 7.95). That creamer is so cute! I don’t drink coffee but I’d get that. For reasons.